So it is not even summer yet, but with this weekend presenting us with the possibility of crossing the triple digit mark here in AZ, the kids are already upping their demands for smoothies. I am more than willing to oblige them this request since I tend to think of my smoothies as magical little health concoctions in a glass!! I try to pack as many nutrients and health benefits as possible into my smoothies without tipping the scales to the side of “Ewww! That tastes disgusting!” And I honestly think that one of the most important ingredients in my smoothies is Kefir. Kefir is a fermented milk that can be made from dairy based milks such as cow, goat, and sheep, or from non-dairy sources such as the milk of young coconuts, rice milk, soy milk, and even water. It can be made to be friendly to any food allergies. Amongst it’s many reputed health benefits, the antibiotic and antifungal properties are at the top of the list. Health enthusiasts have used Kefir to treat endless disorders ranging from metabolic disorders, allergies, digestion issues, candida, cancers, chronic fatigue syndrome, herpes, depression, sleep disorders, ADHD and too many others to mention here. It is similar to yogurt in that they are both cultured milk products. However, they contain different types of beneficial bacteria. Yogurt contains beneficial bacteria that tend to be transient (they do not take up residence in the intestines). Kefir, however, contains beneficial bacteria that actually colonize the intestinal tract. These bacteria actually remain there to continue to provide positive health benefits. Kefir is such a balancing nourishing food that greatly contributes to a healthy immune system. It contains many vitamins, minerals, amino acids, and enzymes. Some of the most notable are calcium, magnesium, B2 and B12, phosphorus, Vitamin A, Vitamin K, and Vitamin D. Tryptophan, known for its relaxation benefits to the immune system, is an essential amino also abundant in Kefir. The large number of live enzymes (especially in kefir made from raw dairy) lead to even more health benefits. Kefir enhances cell growth, maintenance and energy. It restores gut flora and establishes a balanced inner “ecosystem”. It really is a perfect food! At this point, I think I probably sound like an advertisement here. However, I have seen amazing miracles in my own son, due in large part to Kefir. I think that it has contributed to the amazing intestinal healing that he has experienced over the last few years and I, therefore, am a total believer in it! You can make your own kefir by getting your own starter grains and following the directions listed here (it really is not that hard). However, I actually buy my kefir from a farmer’s market here. Our family prefers our kefir made from raw goat’s milk (no comments please) so that we get all of the health benefits possible. Since you cannot get this year round (they dry the goats up in the winter/spring so that they can “kid”), when spring is coming to an end and summer shows it signs of promise, I become full of anticipation of what will soon be whirring away in my blender. Fret not, however, if you are not anxious to run out and find your closest farmer’s market to pick yourself up some of this tart and tasty beverage. You can buy wonderful pasteurized Kefir at most local health food stores. I am continually amazed at the options of Kefir at our local Whole Foods stores – you can get Cow Milk Kefir , Goat Milk Kefir, and now Coconut Milk Kefir (that I must add is quite delicious). I do want to say here, though, that if you do have any underlying health issues (such as candida), you would probably want to introduce kefir into your diet pretty slowly so that your body can adjust to the health promoting properties of it. The best way is to start out with just a few ounces in the morning on an empty stomach, and build up from there. Now, if I have not lost you yet and you are still reading, first I thank you, and second, I will stop touting the glories of this beverage and will instead list the ingredients to a typical smoothie in my house. This one is packed full of berries and greens, however, my oldest son’s favorite blend involves bananas, sunflower seed butter, kefir, raw honey, and raw coconut butter. But that one we’ll save for a different day, a different post! 1/2 cup frozen or fresh organic spinach (or kale or any other greens – if using kale, make sure you have a strong blender. Vitamix does an awesome job with kale)-You won’t taste it, I promise!!! Throw in the bananas, berries, cherries, greens, kefir, coconut butter (or coconut oil), and raw honey. If you are not using any frozen fruit, you should probably add some crushed ice to make it nice, cold, and refreshing! Blend all together for about a minute, or until really creamy and smooth! You can add more liquid (kefir, organic juice, or water) to whatever your desired consistency is. Smoothies are so forgiving, so you can really play around to make your own “magical concoctions”. I have also been known to toss in a number of other intestinal healing supplements into the smoothies, but shhhhhh! The boys have no idea. What they don’t know… will only make them healthier. Thanks so much!! I’m always looking for new “green” recipes that the kids will love. Mmmm! This looks delicious. I love coconut, and the coconut butter sounds like a yummy addition. I also love Kefir! Rhiannon, you have to try the Coconut Butter. Everyone that tries it says that you can eat it straight from the spoon! It sort of tastes like a dessert! Those looks so good!! I just got some kale in my CSA box, so I think I will be making one of these tomorrow! Heidi, your new Vitamix would do great things with that Kale in this smoothie!! Do you guys like Kefir? You are inspiring me to get more creative with the kefir smoothies in our house! Right now we are just doing kefir, fruit, and protein powder, but your version sounds much better! Love you! Kim – I love this smoothie! I adopted you through Book of Yum’s monthly Adopt-A-Blogger event. This is going to be my new go-to smoothie. I especially love the addition of the goat’s milk kefir. While I haven’t been able to do dairy, this particular kind of kefir agrees with me, so I’m good to go! 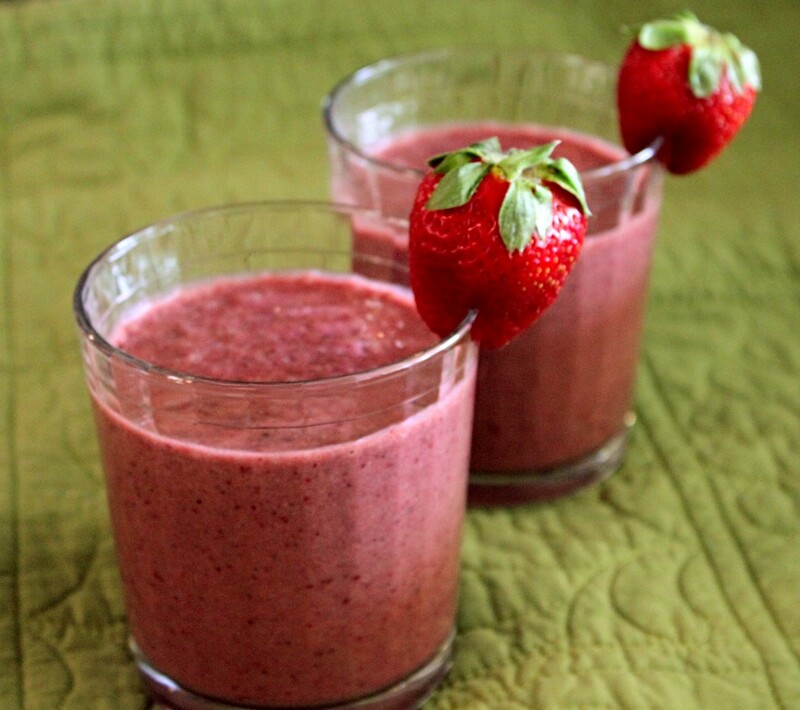 Hi Kim, I will be featuring this smoothie recipe in my post, “10 Super Smoothies”, fyi! Sounds great, Tessa! THanks for letting me know! 🙂 Cannot wait to see your post! This looks wonderful and nourishing. Would you mind posting it on my pregnancy food blog carnival superfood sundays? This berry smoothie is definitely one of my favorites because it is delicious, filling, and healthy. Great site. Thanks.